There are so many different types of smartphones that are produced by so many different names nowadays. It seems that every time you get an upgrade, the next day there is another new phone on the market. While there are so many different smartphones available, there are three that really stand out: Android, iOS and Windows Phone. While the former two are the biggest competitors, the latter kind of sits on the sidelines, waiting for its moment to catch up with the greatness of Android and iOS. If Microsoft wants to stay in the smartphone game and continue to be a top competitor, it is really going to have to boost up its efforts in order to stand a chance against Android and iOS. With minor changes, Microsoft can be a real contender in the smartphone competition. The notification system on Microsoft has helped to put it behind the Android and the iOS. Notifications are one of the key features that smartphone users consider when choosing and using a brand. Both Android and iOS have amazing notification systems. These systems alert their users about their notifications via a drawer that is located at the top of the screen. Inside this drawer sits an icon that lets users know what application they have an update on. In order to access these updates, the user simply has to pull down the drawer, select the update and he will be taken directly to the application. Microsoft does not have this notification system. Instead, a simple banner appears at the top of the Microsoft smartphone when a notification is received. When a user taps on the screen, he will be taken to the application; but if he isn’t quick enough, he will miss it. In order to compete with Android and iOS, Microsoft needs to implement a similar notification system. Believe it or not, something as simple as a calendar is a pretty important feature to a lot of smartphone users. Android and iOS smartphones offer calendars that are easy to access, easy to organize and easy to use. Not only can the events of a particular day be easily viewed, but so can the events of a week or an entire month. Calendars on Microsoft smartphones, on the other hand, are quite a disappointment. They don’t offer any bells and whistles. You can see events you have added on a given day, as well as access a to-do list. However, when it comes to the monthly view, Microsoft’s calendar is abysmal. The text is minuscule and with no color coding, it is nearly impossible to tell what your monthly schedule is at a glance. Microsoft really needs to step up their calendar in order to make it more user-friendly. Let’s face it; apps are the meat and potatoes of a smartphone. Without the ability to access a wide range of apps, a smartphone kind of serves very little purpose. Android and iOS have really got the apps thing down pat, offering a wide range of full-functioning apps. Microsoft, in comparison, really falls far behind in the apps category. The apps that are offered are basic and can’t really do too much. In order to improve this, Microsoft really needs to re-work their app structure and offer a wide range of brand name apps in order to even stand a chance against Android and iOS. 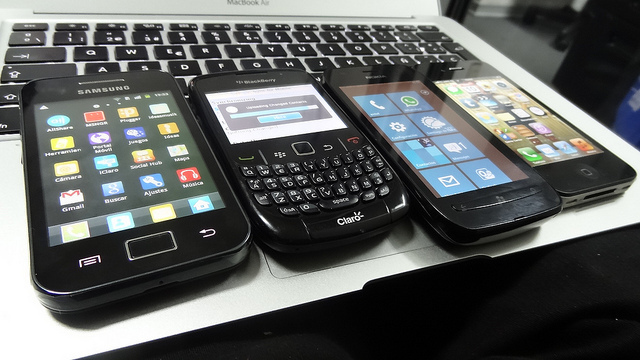 Overall, the Microsoft smartphone isn’t a bad phone; however, it is more like a basic phone. Those who are more tech-savvy and looking for a phone that can meet all of their needs will have much more enjoyable and useful experience with iOS and Android. In order to make the Microsoft smartphone more appealing, it is really going to have to up its game. Matt Thames is author and Brand Manager for Selby Acoustics. He enjoys writing about tech and entertainment topics. You can find him on Facebook, Twitter and G+.